Best of the Week: Apple iPhone X, Naim Uniti Nova, BenQ 4K HDR projector and more | What Hi-Fi? This week, KEF announced a new range of Kube subwoofers, dCS revealed that its products will receive a MQA update before Christmas and BenQ launched the W1700, a 4K HDR projector costing under £2000. 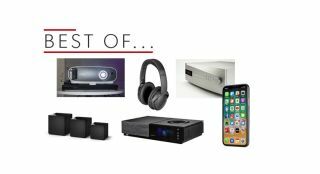 For reviews, we have Apple's iPhone X, Naim's Uniti Nova all-in-one box and Bose's QuietComfort 35 II noise-cancelling headphones. The Kube8b, Kube10b and Kube12b are driven by 300W Class D amplifiers, and each features LFE, line and speaker-level inputs. They also have phase selection, EQ tuning presets and smartConnect, a feature that detects your room configuration and adjusts volume levels accordingly. The Kube8b, Kube10b and Kube12b are available now, priced £500, £600 and £700 respectively. dCS is rolling out MQA support across its range of products, which should arrive in time for Christmas. The update for the dCS Rossini is available now, while the Vivaldi One and Network Bridge will get it later this month. Expect the Vivaldi DAC and Upsampler to receive MQA in December. You can update the firmware via the 'internet download and update' functionality. 4K HDR projectors can be expensive, but BenQ is looking to buck the trend with its W1700. Costing under £2000, it would be cheaper than the Optoma UHD65. It boasts 2200 lumens and two HDMI connections, one of which supports HDCP 2.2 functionality. There's also support for HDR10. The W1700 will go on sale in January 2018, priced "under €2000" (£1770). Kanye West to start his own streaming service? HDR10 vs Dolby Vision: which is better? "If you resisted temptation on the iPhone 8 and 8 Plus, the X will absolutely have been worth the wait"
The iPhone X proves to be very familiar, but also very different from previous iPhones. Not everyone will like the changes - there's no home button and no bezel, for starters - but the screen is still stunning, the audio is impressive and the performance, design and build impeccable. The omission of the headphone jack is disappointing and FaceID is not without a few issues either. However, this is the best Apple phone yet… if you can afford it. "It looks good, is built to last and is lavishly specified"
Naim's Uniti Nova makes a convincing argument for a one-box solution. With its elegant looks, muscular, detailed and confident sound and comprehensive functionality, the Nova offers little in the way of performance compromise. It's not cheap, but for the price you get more of that sparkling Uniti experience. "We expect these headphones to become travelling companions for many a frequent flier"
We enjoyed the QuietComforts when they came out, and the IIs are another resounding success. They may not be the best sounding pair of headphones, but they offer a functionality that its rivals can't match. If you travel a lot, these headphones would be a great choice to keep the noise at bay and listen to your music in peace.